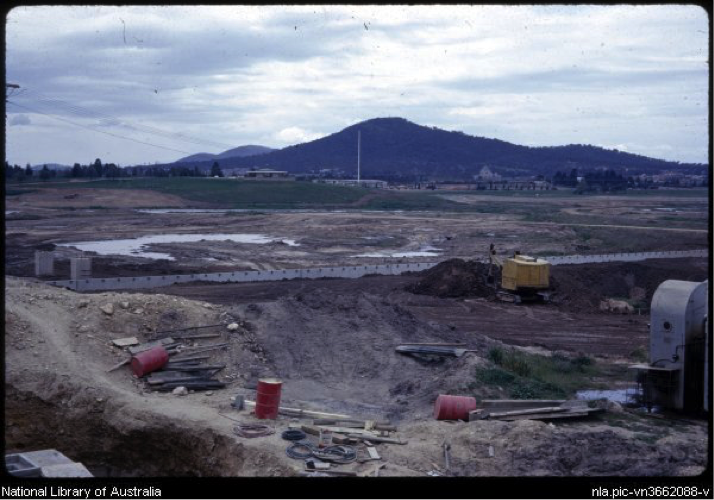 My first job in Canberra with the Bureau of Mineral Resources was logging drill core during the investigations for a dam that would turn the Canberra floodplain into a lake as envisaged by Walter Burley Griffin. The Canberra floodplain was about half a kilometre wide and the low level bridges were frequently flooded. 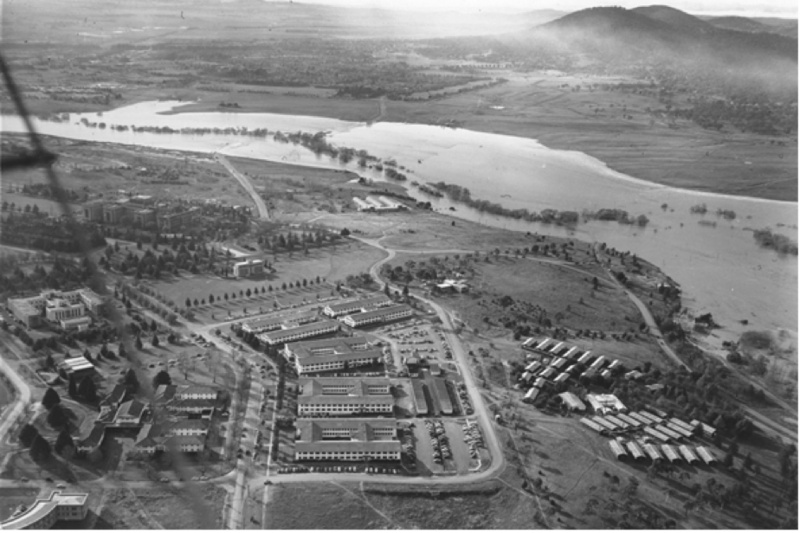 Molonglo River in flood , 1956. 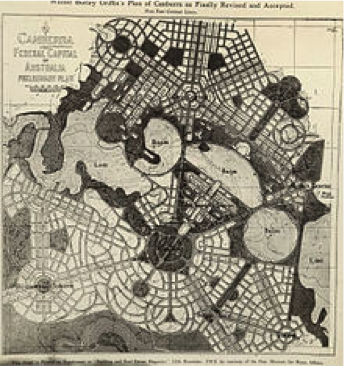 In 1911, a competition for the design of Canberra was launched by King O’Malley, Minister for Home Affairs, and Scrivener’s detailed survey of the area was supplied to the competing architects. Walter Burley Griffin won the Design Competition. Burley Griffin’s wife, Marion Mahony Griffin, also an architect, collaborated with him on the design competition entry, and is known to have prepared the design drawings that accompanied the Burley Griffin entry. I attained a Science Degree in Geology with Honours at Queensland University in 1957 working on sediments to the southwest of Brisbane. I transferred to the Bureau of Mineral Resources in Canberra in May 1958 and felt the cold. I worked from an old military prefab hut that was also cold. I wore a greatcoat for 7 years, inside the office as well as outside until one day I felt hot and never wore it again. I was map editor for the maps of northern Australia, sited bores for farmers in the ACT and adjoining NSW, supervised drilling the bores and conducted pumping tests. I added my fieldwork observations to the geology of Canberra that had been published by Dr. A. Opik in 1954. Dr Opik had been the Professor of Geology at the University of Estonia and was a world authority on Trilobite fossils and he migrated to Australia after Russia invaded Estonia in 1939. I had no understanding of the geology of Canberra where rocks had been deformed by complex folding and faulting and minerals had recrystallized to form low grade metamorphic minerals. When Melbourne University opened a Geology campus under Professor David Brown in Canberra in 1960, I was the first post-graduate student. I supervised practical work, attended all undergraduate lectures by Bruce Chappell, Alan White and Mike Rickard and completed my Master’s thesis on the Farrer-Hoskinstown area in NSW in 1965. 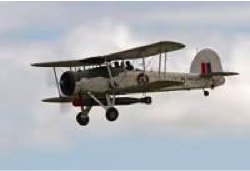 Professor Brown was in UK at the beginning of World War II and was a pilot on Swordfish aircraft that attacked the Scharnhorst and Gneisenau with torpedoes as they steamed through the English Channel from Brest to Hamburg. After the war he translated the Geology of Russia into English. Excavations for Lake Burley Griffin began in 1960 and the entire lake floor was excavated to a depth of at least two metres to provide sufficient clearance for boat keels. Another reason given for this was that mosquitoes would not breed nor would weeds grow at such a depth. Clearing of vegetation removed trees from the golf course and along the river, and houses. At least 382,000 cubic metres of topsoil was excavated and stockpiled for use at several public parks and gardens, including the future Commonwealth Park on the northern shore. It was also used to create the six artificial islands including Springbank Island. The island was named after the former Springbank Farm that was situated there. Land excavated to create a sailing course at Yarralumla was used to create the thematically-named Spinnaker Island to its north, while excavated stone was moved beside the Kings Avenue Bridge at the eastern edge of the central basin to form Aspen Island. Rock on which the dam was to be built. Site testing for both the Commonwealth Avenue Bridge (310 m and the Kings Avenue bridge took place during late 1959 to early 1960. The construction of the Kings Avenue Bridge (270 m) began in 1960, followed by Commonwealth Avenue Bridge the year after. They were designed to allow the passage of recreational sailing boats with tall masts. Vertical retaining walls were built in the Central Basin, some beaches and grassy slopes were constructed and the natural foreshores were retained elsewhere. The dam was completed in 1964 and named after Scrivener. It was a monument to the man who first suggested the region as the most suitable for the new Australian Federal Territory. 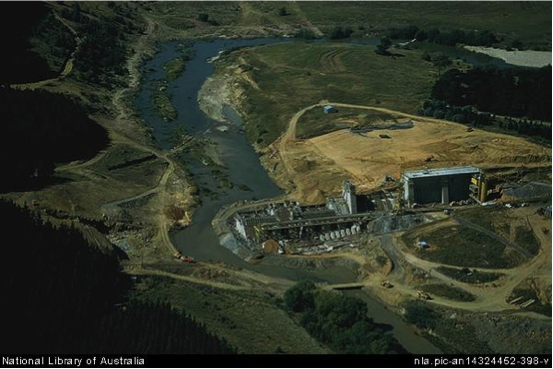 The dam’s purpose is to form the famous recreational water feature known today as ‘Lake Burley Griffin’ by effectively filling the floodplains of the Molonglo River on the ‘Limestone Plains’. A number of geophysical traverses were shot across the valley and a site was chosen for the dam near Government House, Yarralumla. At the dam site clearing of vegetation and soil exposed the rock on which the dam was t o be built. Three major faults crossed the channel and a low angle fault sloping downstream indicated that the central section of the dam would be built on a block that could slide downstream. This was overcome by angling anchor cables upstream through the block. The concrete gravity dam is 33 metres high and 319 metres long with a five bay spillway controlled by 30.5 metre wide, hydraulically operated fish-belly flap gates with a total discharge capacity of 8 500 cubic metres a second. The German designed and built fish-belly gates are rare in Australia and allow for a precise control of water level. This is important in a recreational and ornamental lake because good water-level control eliminates a dead area between high and low water. It took 55 000 cubic metres of concrete to build the dam. The maximum wall thickness is 19.7 metres. The dam holds back 33 million cubic metres of water with a surface area of 664 hectares (approximately seven square kms). The lake has a shoreline of 40.5 kms (with a recreational walking/cycle track around it) and is 11 kms long and up to 1.2 kms wide. As well as providing a recreation resource, the dam and lake have created important wetland habitats for native fish, birds and wildlife. 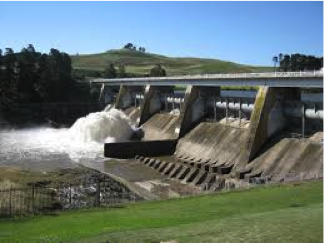 The dam provides flood control for the Molonglo-Queanbeyan section of the Murrumbidgee catchment and will be able to accommodate a one in 5 000-year flood. The only time in the dam’s history that all five gates were opened was in the flood of 1976.